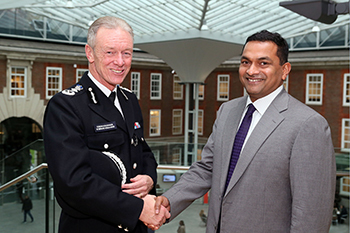 The Commissioner of the Metropolitan Police Service (MPS) Sir Bernard Hogan-Howe visited Middlesex University yesterday (2 December) to launch a new partnership between the MPS and the School of Law. Britain's top policeman announced that he has appointed Professor Joshua Castellino, Dean of the School of Law, to conduct an independent review of the MPS's use of section 60 stop and search powers. Professor Castellino, along with his Middlesex colleague Dr Robin Fletcher and human rights barristers Samantha Knights (Matrix Chambers) and Joseph Middleton (Doughty Chambers), will produce a set of recommendations for the MPS based on their findings, which will then be made publicly available. Assistance will be provided by nine criminology and sociology undergraduates, who will each join a different borough as volunteers to assist with stop and search research. Particular areas of focus will include how officers formulate 'reasonable grounds' for suspicion and looking into a potential new measure of disproportionality. Head of the Department of Criminology and Sociology Professor Kevin McDonald said the project represents "an important opportunity for our students to be involved in research". Section 60 is a controversial power that enables officers to stop and search any pedestrian or vehicle within a particular area during a specific period of time, without the need for reasonable suspicion. Although the MPS has already made significant inroads into reducing the numbers of people targeted, it wants to do more to build better relationships with local communities. And Sir Bernard is hopeful that by employing Middlesex University as a 'critical friend' Londoners will develop greater levels of trust in the police. 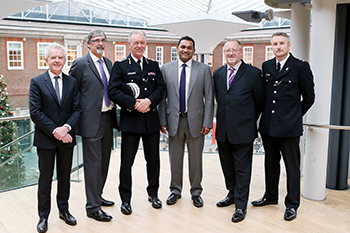 "The MPS has led the way in changing how stop and search is both used and scrutinised and this innovative partnership with Middlesex University and input from students will build upon those improvements and further influence and enhance our approach," he said. "I am particularly pleased to welcome Professor Castellino as the new independent reviewer of section 60. Joshua is a respected figure who has a proven record in supporting human rights around the world. This new and important position will improve the openness and transparency in the use of this key power and will increase public confidence in stop and search." Commenting on his appointment, Professor Castellino said that human rights research must go beyond highlighting flaws. "Our role as human rights lawyers doesn't end in being critical," he commented. "At Middlesex we don't believe in ivory tower research – we are about understanding social justice, we are about understanding problems as they arise in society and we are intrigued by the prospect that the work we do will provide real-time answers to real-world problems." 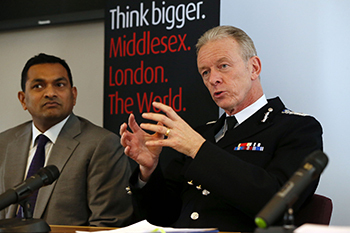 Associate Professor in Criminology Dr Robin Fletcher, himself a retired Detective Superintendent, added that Middlesex University's diversity makes it the ideal candidate to carry out this important work. "We have a very diverse student group who will bring their own experiences to this project," he said. This collaboration is the latest in a long line of partnerships with the MPS. In September 2014, representatives of the force attended Dr Simon Harding's conference on gang violence to discuss ways of tackling the issue.